In 1609 the German artist Adam Elsheimer created his Flight into Egypt. Tiny as it was – it measures just 31 x 41 cm (about the size of an A4 sheet of paper) – it succeeded in portraying a familiar Bible story against an almost infinite vista of the night sky. It has been described as the first true moonlit scene, and the first naturalistic depiction of the night sky in Renaissance art . The Flight was a painting that broke a number of traditions. It would come to have enormous influence on painters as illustrious as Rembrandt and Rubens. And, in its way, it even helped create a new way of looking at the world. Tragically, Elsheimer would die just a few months after completing his masterpiece. It was found on the wall of his bedroom in Rome on his death in 1610 . In this article, we examine its remarkable story, and its continuing legacy. 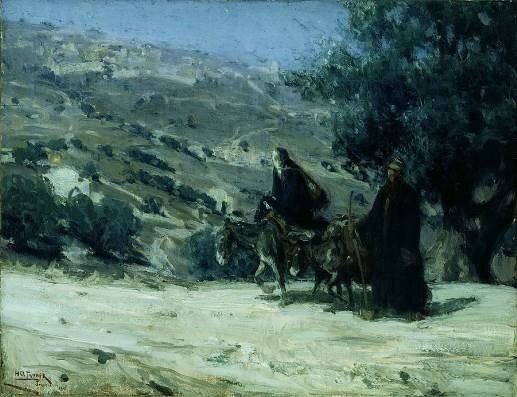 The Biblical story of the Flight into Egypt begins in Jerusalem. Certain wise men from the east had arrived there, asking, “Where is he that has been born, the king of the Jews? We have seen his star out in the east, and we have come to worship him” . Their question meshed with an earlier prophesy that just such a leader would arise, prompting King Herod, fearful of a new rival, to order that all male children born in the past two years be found and killed . Of course, the baby Jesus fitted this description. Fortunately, however, an angel had given an early warning of the Massacre to Joseph in a dream. The angel told him, “Rise up, take thee the child and his mother, and flee to Egypt; there remain till I give thee word”. Joseph wasted no time. While it was still night, he took the child and his mother with him, “and withdrew into Egypt where he remained until the death of Herod” . This is actually the only Biblical evidence of the Flight, though the story has subsequently been extensively elaborated with details from other sources, ranging from the apocryphal to wishful invention. Over the centuries, such a dramatic episode was bound to attract many artists. Traditionally, the Flight came to be depicted with Mary and the child on a donkey, being led by Joseph. Most of these depictions took place during day, often in some setting familiar to the particular artist, complete with obvious clues such as haloes to remind us that we are witnessing a holy event. Elsheimer’s work broke with this tradition in a number of ways. Firstly, he set it in the deep night, a feature that was actually consistent with the Biblical account. Secondly, he depicted that night sky in an extraordinarily detailed and naturalistic way. And thirdly, he avoided obvious and outward religious symbolism, replacing it with far more subtle reminders of the subject’s religious significance. Let’s look at what’s happening in the painting. The Holy Family are on their way to Egypt by night. Mary and the child are astride a donkey, with Joseph close behind with a flaming torch. The fugitive family trudge around the edge of a moonlit lake to the apparent safety of a shepherd’s campfire in the woods. Above is a huge expanse of sky, with over a thousand individual stars. Elsheimer has composed the painting very carefully. The scene is divided by the diagonal sweep of the Milky Way from the top left down towards the bottom right, which incidentally draws our attention to the Holy Family. This angle is reinforced by the line of the trees. At the same time, the painting also recedes from the foreground at left to the background at right, so the lowest point is also the furthest away . The three clumps of trees also mark the three elements of the picture, which in themselves comprise separate genre scenes – the pastoral idyll of the shepherds, the family scene and the moonlit landscape . In turn, each of those elements has its own source of light ~ the torch for the family, the campfire for the shepherds, and the moon, stars and reflections for the lake. These individual scenes are unified by the all-encompassing sky , and by the sparks which float upwards from the shepherds’ fire to seemingly join the stars in the Milky Way (Fig 4). As the work is painted on a smooth nonporous copper surface, the luminosity of the paint is intensified. allowing details to be sharpened and the colours to sparkle out of the darkness . Elsheimer also injects strong symbolic significance into the human actors in the painting. So, for example, the shepherds at the campfire are a reminder of the shepherds who followed the angel’s urging to travel to Bethlehem to witness Christ’s birth . The constellation of Leo, traditionally associated with kingship and strength, is placed centrally over the Holy Family, and its brightest star (Regulus or Little King) is placed over the Christ child. The other main constellation, the Great Bear, is associated with Diana, goddess of the moon, chastity and virginity, all virtues that are also associated with Mary . The downward slant of the Milky Way is also a reminder of its traditional guise as the “Jacob’s Ladder” [or Street] which went up to Heaven, with angels climbing up and down, and God looking down from on high (Fig 5) . Elsheimer’s complex interweaving of these compositional and symbolic elements is designed to bridge the vastness of the sky with the domestic intimacy of the fleeing family, and to provide reassurance to the viewer that they are under divine guidance and protection. Without the need for haloes, angels or unearthly light, the darkness, which normally would be a cause for fear, is instead portrayed as a comforting refuge . As we have mentioned, it was highly unusual for the scene to be set at night, despite the Biblical account. In fact, artists had struggled to achieve convincing depictions of night-time for centuries. (You can read more about this in our Science Becomes Art article.) In view of this, the level of precision and detail evident in Elsheimer’s depiction of the heavens is particularly remarkable, and clearly indicates that the artist has studied the sky very closely. As Deborah Howard has pointed out, Elsheimer has carefully illustrated the irregular, cratered features on the surface of Moon and, for the first time, managed to resolve the Milky Way into myriads of individual stars. In addition, the relative positions of the stars in the constellations of Ursa Major (the Great Bear, Big Dipper and Plough) and of Leo are accurately represented, as is the prominence of the brightest star of Leo (Regulus). This is clearly not just a scattering of stars at random . These features have prompted the belief that Elsheimer may even have painted the sky as it appeared on a particular night – reputedly, the sky over Rome on 16 June 1609  – and, furthermore, that he did so with the aid of the newly-invented telescope which had been unveiled shortly before. There is considerable evidence for this, but some caution is warranted on both counts. Although, the relative positions of the constellations are accurate, their sizes seem to be much smaller than they would appear in the real sky. It can also be questioned whether the Milky Way, normally only detectable as a faint feature on dark clear nights, could be so clearly discerned when the moon is full and the sky is cloudy, as depicted in the painting . As to the possible use of a telescope, Elsheimer was certainly interested in recent developments in this area, and mixed with the group of scholars congregated around Johann Faber (who became the executor of his estate), and the natural scientist Federico Cesi . The basic idea of combining convex and concave lenses to produce a magnifying effect had been “in the air” in the early 1600s, and Hans Lippershey had (unsuccessfully) applied for a patent for a type of telescope in 1608. But while Elsheimer was creating his painting during 1609, Galileo was still in the process of improving magnification levels. He made his first observations of the Moon in November 1609 and observed the Milky Way and its resolution into stars over succeeding months, eventually publishing his findings in his Sidereus Nuncius in March 1610 . Given this timeline, and the fact that Elsheimer was a notoriously slow painter, it seems a moot point whether he could actually have based his painting on a Galilean telescopic view, unless he had advance knowledge of Galileo’s work in progress. Alternatively, he may perhaps have had access to a primitive version of the telescope developed independently by Cesi. 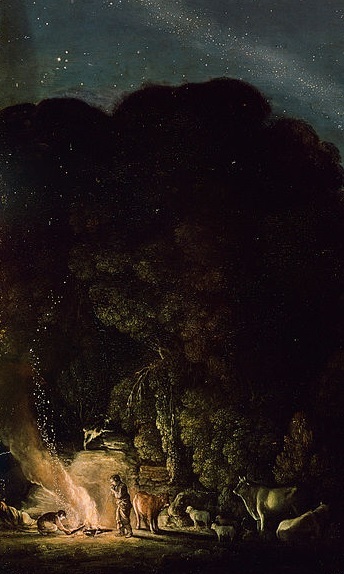 In any event, however, much of the detail that Elsheimer needed was already available – some irregularities on the surface of the moon had already been observed by Leonardo da Vinci with the aid of occhiali (spectacles), and by a handful of artists such as Van Eyck ; the constellations could adequately be observed with the naked eye; and it was already known that the Milky Way was composed of stars, as depicted by Tintoretto in his Origin of the Milky Way (Fig 6), though in nowhere like the number or precision achieved by Elsheimer. Be that as it may, Elsheimer was certainly the first painter to have the bold idea of using an objective, naturalistic and extremely detailed, comprehensive view of the heavens as the basis for an artistic work. On Elsheimer’s death, Rubens lamented, “I have never felt my heart more profoundly pierced by grief than at this news… Surely, after such a loss our entire profession ought to clothe itself in mourning.... He had no equal in small figures, in landscapes, and in many other subjects" . Elsheimer’s Flight was to have an influence out of all proportion to its size . Its fame spread as result of the wide circulation of an engraving by Goudt (Elsheimer’s pupil and patron). Elsheimer’s new kind of composition –a low horizon and diagonals moving obliquely into background, had a major influence on landscape painting in Italy and Northern Europe (Fig 7) . The novelty of the moonlit setting influenced artists such as Claude Lorraine. Both Rembrandt and Rubens were admirers of the Flight, and Rembrandt’s later version of the subject appears to have been significantly influenced in its composition and use of light-sources by Elsheimer’s work (Fig 8) . The Flight into Egypt has continued to interest artists right up to the present day, with their works often reflecting contemporary social, artistic or historical knowledge or concerns. So, for example, the incongruously European setting, so common in early works (including Elsheimer’s), gradually gave way to a rather more Egyptian-looking setting, for example in Poussin’s 1677 version. However, more geographically accurate depictions really began with the increasing awareness of Egypt that arose from archaeological discoveries, the spread of photography and the new interest in Orientalism (Fig 9). More recently, the persecuted status of the fleeing family has evoked works based on current issues of homelessness and the refugee crisis (Fig 10). Outwardly secular interpretations of the Flight have also reflected a decline in institutional religion, perhaps in favour of the immanence of ordinary life (Fig 11). In his Flight, Elsheimer introduced two novel aspects to a familiar theme. First, he depicted the scene at night. Second, he relied on a completely naturalistic, closely observed astronomically-consistent setting. In effect, the artist’s scientific realism lends credibility to the biblical account. This enabled him to do away with typical religious motifs such as haloes, angels or heavenly light, while at the same time imbuing the work with rich religious symbolism. His melding of religion, art and science is a particularly impressive achievement, particularly for such a small painting. Like all good stories, the Flight into Egypt can be interpreted on a number of levels that can be elaborated far beyond the basic plot – issues of persecution, refuge, faith, inner dignity and even humanity’s place in the natural world. It is for this reason that it will no doubt continue to attract artists who wish to follow in Elsheimer’s steps by reimagining ancient story-lines in a contemporary context. 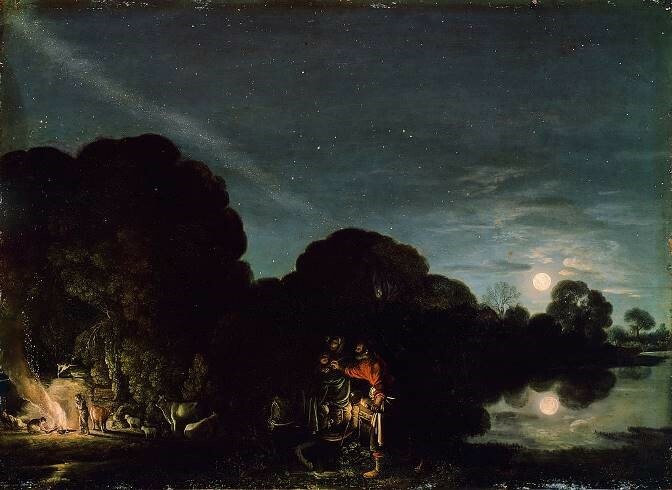 Deborah Howard, "Elsheimer's Flight into Egypt and the Night Sky in the Renaissance". Zeitschrift für Kunstgeschichte 55 (2): 212 (1992). Howard (1992), op cit. It currently hangs in the Alte Pinakothek, Munich. Bible, Matthew: 2:2. It is possible that the “‘star” was in fact an appearance of Halley’s comet: see our article Comets in Art. This was the so-called Massacre of the Innocents. This was quite innovative at the time. Florian Heine, “The Universe, Infinite Distance….”, in The First Time: Innovations in Art, Bucher, Munich, 2007, at 108. Mary is commonly associated with the Moon, for example in Cigoli’s Immaculate Conception 1612 and Murillo’s Immaculate Conception of 1670: see Gerhard Hartl and Christian Sicka, essay in Reinhold Baumstark, ed. Von Neuen Sternen. 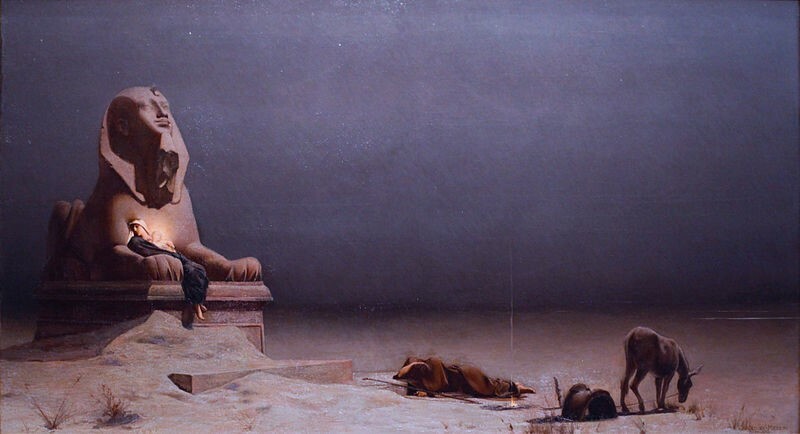 Adam Elsheimers “Flucht nach Ägypten”. Cat. Exh, Pinakothek-Dumont, Munich and Cologne 2005/6. Genesis 28:12. See Rüdiger Klessmann & Ors, Adam Elsheimer 1578-1610 (Catalogue), National Gallery of Scotland/ Paul Holbertin, Edinburgh 2006, at 174. An angel climbing the Ladder to Heaven is also depicted on the West Front at Bath Abbey. 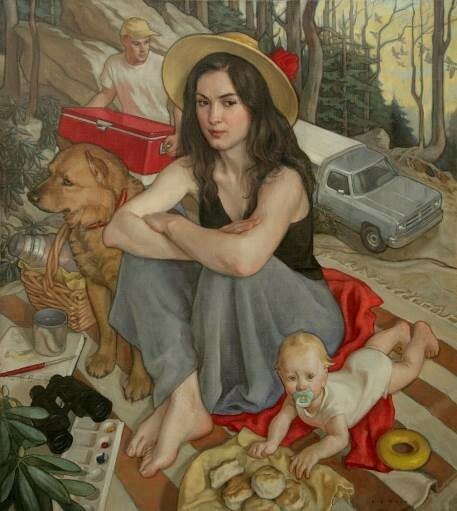 Hollander has commented that this outwardly prosaic depiction against a vast backdrop gives the work a camera-like quality – cinematic rather than theatrical: see Anne Hollander, Moving Pictures, Harvard University Press, Cambridge/London 1991, at 104. Deborah Howard and Malcolm S Longair, “Elsheimer, Galileo, and The Flight into Egypt, Conf Paper, The Inspiration of Astronomical Phenomena VI, ASP Conference Series 441 (2011). Heine, op cit; Hartl, op cit. Howard (2011), op cit; Keith Andrews, Adam Elsheimer: Paintings, Drawings and Prints, Phaidon Press, Oxford, 1977, at 155. Klessmann, op cit, at 177. Howard (2011), op cit at 27. See generally Roberta JM Olson and Jay M Pasachoff, “Moon-Struck: Artists Rediscover Nature and Observe”, Earth, Moon and Planets 85-86 at 303 (2001). Klessmann, op cit at 38. Howard (1992) at 212; Howard (2011) at 23. A similar use of light-sources appears much late in Caspar David Friedrich’s Evening on the Baltic Sea (1831).